New threats are again on the rise in Gambella as the Meles government attempts to exert increasing federal control of the region, leading to new clampdowns against civilians. Many believe that these actions are meant to suppress the deepening local protest over the increasing land-grabs, the upcoming pre-determined election—where names of election ‘winners’ have already been leaked—and to the increasing pressure by government authorities on the citizens to cover up the real perpetrators of the 2003 genocide of the Anuak by attributing the blame to the Anuak themselves. This is an issue that resurfaced following the recent Voice of America broadcast heard by millions throughout Ethiopia where Genocide Watch President, Dr. Gregory Stanton, spoke of a 16-page document obtained in 2004 from the office of the former Chief of Security, Omot Obang Olom, now the current governor of the Gambella region, which closely linked Meles, his administration and Governor Omot to complicity in the genocide of the Anuak in 2003. The document provides information regarding a meeting held on September 24, 2003, in the office of Prime Minister Meles Zenawi, where the Prime Minister, Governor Omot and other high level officials of the current regime began plans for what to do with those Anuak who had become an obstacle to their plan to exploit the oil on Anuak indigenous land. In negating this report, now delegates from Addis Ababa, along with Governor Omot, are pressuring the Anuak to go all the way back to 1991 to take responsibility for the killing of highlander settlers at that time and for the ethnic problems all the way up to the December 13th massacre, essentially blaming the Anuak for all of it. The Anuak and other Gambellans were first pressured to hold a public rally in protest of the VOA program’s statements—saying that the defense troops had nothing to do the massacre; however, the people refused. Now, the TPLF government has produced a petition that essentially blames the Anuak for the December 13-15, 2003 Anuak massacre, in an incredible example of the illogical leaps this government must use in an attempt to cover up the vast evidence of their own complicity. The governor is threatening to take action if the people refuse to sign it. Because of such threats, some 200, especially women, young students, are signing it. Allegedly the goal is to obtain 2,500 signatures, which it looks like they will not accomplish in Gambella town alone so they have gone to the rural areas and have brought 350 people from all the Woredas to the town to sign and intend to keep the pressure up until they have all the signatures. If the young Anuak students do not cooperate, they may find themselves out of school, or worse yet; in jail. However, some are standing up with courage. A particularly noteworthy example came not from an Anuak, but from a Nuer man. It may be remembered that the massacre was first called an ethnic conflict between the Nuer and the Anuak; mostly blaming the Nuer when in fact there is a conflict between them in the past, they never killed each other in this way. They usually resorted to solving their problems through their elders. The truth is, there were numerous examples where Nuer actually protected the Anuak in their homes. At the meeting where these demands were made, this bold Nuer student stood up and essentially said, “This meeting is being called to divert attention from the real killers. Why are we trying to look for the criminals who killed the Anuak when we all know who they are? Some of them are the ones running this meeting or are the ones who called it. The criminals you are trying to look for are in here. This meeting is an effort to blame the killing on someone else.” He was then kicked out of the meeting. At the same time, there are well-substantiated rumors that Governor Omot has compiled a list of some 25 to 30 Anuak to be arrested for allegedly using their access to computers and email to pass on anti-government information to outsiders. It may be recalled that he was also the one who had compiled the list of those Anuak to be targeted for murder in 2003. Now he is the one still actively working with the Meles government to sell out the people of Gambella once again. He may think that stealing the land and the resources is much easier when you make victims cover up for the guilty and then deny them any voice or political rights, but this will all certainly backfire—perhaps, sooner than he thinks! Substituting Anuak scapegoats in 2010 makes the regime’s effort all the more ridiculous! Since the 2003 genocide, no one has been brought to justice for the crimes; yet, following the VOA broadcast, which pinpointed Meles and his regime as masterminds of the horrific crimes and called for a full-scale investigation by the UN High Commissioner, Justice Navanathem Pillay, there is now this all-out desperate effort to scapegoat the victims. It flies in the face of the government’s own admissions, their own whitewashed Commission of Inquiry Report and other statements made to the public. Consider the following statement posted by the UN press group, IRIN, on March 5, 2004, "The Ethiopian government said on Friday that it had apologized to local tribes for its inadequate response to prevent a massacre in the troubled western region of Gambella. A statement released by the federal affairs ministry said the government had not performed ‘proactively’, but promised that the killers would be brought to justice." On July 14, 2004, IRIN again posted an official statement made by the head of the Commission of Inquiry, a commission appointed by the government to investigate the Gambella massacre, indicating the government’s own findings of Ethiopian defense troop involvement. They state, "Kemal Bedri, the chairman of the commission, said more than a dozen eyewitnesses had provided evidence of the involvement of defense ministry forces in the attacks." Now, over six years later, Ethiopian Federal Security agents are trying to force the Anuak into accepting responsibility for the massacre of the Anuak! However, just as the human rights crimes in 2003-2006 were about oil, the current repressive efforts are about both land and resources. As many know, genocide, crimes against humanity and other human rights crimes are not random. The targets are almost always marginalized people sitting on valuable natural resources—like petroleum (oil and gas), gold, fertile land, water resources and other minerals. Gambella has all of these. When it is only the people who stand in the way of the powerful; preventing them from gaining access to these resources, only ‘conscience’ will prevent the unthinkable from happening. No one really knows how much land in Gambella has been leased to multi-national companies, foreign governments or wealthy individuals, but the Anuak know that at least 350,000 hectares or more, approximately 865,000 acres, of some of the most fertile indigenous Anuak land, has been confiscated by the Meles regime, with plans to obtain more. Most of this land will now be leased almost exclusively to foreigners for up to 99 years for significantly less than its equivalent value elsewhere—like in Indonesia and Malaysia where similar land goes for $350 per hectare. Most of the production will be exported to their own countries and sold for a profit elsewhere, leaving the local people out of the loop with the exception of working for these companies for salaries below UN standards. The local people have never been consulted nor paid compensation for any land they lost through eviction. The TPLF government is reported to be independently signing these lease agreements with investors in Addis Ababa, similar to what happened with the Berlin Conference many years ago when decisions of how to divide up Africa land were made without consulting Africans. No wonder why a level political “playing field” is such a threat and why every aspect of the upcoming election is already concluded, with all the winners selected. Any genuine free and fair election would certainly mean that those in authority would be replaced by leaders more interested in ensuring that new safeguards and protections for ethical business investment in the region were put into place to make certain that the people were not excluded and exploited unfairly. Under these circumstances, it is hardly surprising that some protest these exploitive arrangements; however, there is no tolerance for any criticism. One outspoken opponent to the land-grabs was a young Anuak man Mr. Kwot Agole, who was shot and wounded in his home. He was accused of being a thief; however, most believe it was intended to silence him and others. Similarly, a young outspoken Anuk woman was also shot and wounded—as a bystander—by security forces when they opened fire on what they called, ‘trouble-makers,’ in a secluded location; however, again, most believe it was politically motivated. Those who committed these crimes were never arrested. Meles regime wants land, but not the people! The only thing that will stop Meles and his TPLF elitist cronies from killing and oppressing the Anuak, as well as other Ethiopians, is when they have taken all they want from one of the poorest regions in one of the poorest countries in the world. For many years and up until now, the entire region of Gambella, also shared with Nuer, Komo, Opo, Mazengir, Tigrayans and other highlanders, has been one of the most neglected regions in Ethiopia. There are three technical schools, but not even one university. Little of the development money ever makes it to Gambella. No money from the Productive Safety Net Program is designated to this region. Much of the infrastructure destroyed by the Ethiopian Defense Forces at the time of the Anuak genocide and two subsequent years of human rights abuses, still have not been restored. One example is access to clean water. The one poorly equipped hospital in the region does not have clean water. Many of the wells that were destroyed at the time still have not been repaired. 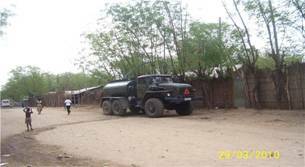 Access to clean water in the largest town in the region, Gambella Town, is still so poor that the new troops coming into Gambella are filling their water tank truck from the well at the church—East Gambella Bethel Synod, parking their large truck at a very narrow location near the gate where the Anuak children used to, but can no longer, play. The water flowage has created erosion that if it continues, will damage the fence of the Synod. Many of the Anuak intellectuals present in 2003 to help advance the region were either murdered at the time or had fled the region as exiles. Some of those remaining in Gambella have openly aligned with Meles. No one in Anuak history may have hurt the Anuak people more than the present Anuak governor, Omot. Fear of his repressive and often heartless tactics have caused resistance to go underground, causing times to be extremely difficult right now as many are kicked off their land. Considering that the Anuak, perhaps numbering only 100,000 people worldwide, were named as an endangered people by Cultural Survival in 1984, the forces against them since that time have been great. The Meles government still is a primary threat to their existence as it is obvious that they covet the land and its resources. So, it is only logical that this regime will only due the bare minimum for the people. Investing in the people—their education, health and well being—simply makes it harder for them to take their land and livelihood. The TPLF/EPRDF government, including Gambella Governor Omot, has encouraged the Anuak who had left the country following the massacre, to come back home. Governor Omot even led a delegation to the US with the objective of convincing those in the Diaspora to return home and invest, saying that things were very good and that there was peace in the region. Last summer, three Anuak men, Obang Kwut, Obang Thamriu and Omot Obang (Omot Wara-Achan) and another fourth who was an Anuak American citizen, decided to return to Ethiopia from Southern Sudan. They were arrested and accused of being insurgents; responsible for the massacre of the Anuak. They were tortured and then brought to Kaliti prison in Addis Ababa. The Anuak who was a US citizen was released last year after a relative in the US advocated for him. The trial for the three who remained took place in March of this year; however to prosecute them, the government needed witnesses so Governor Omot appointed the head of the government-armed Anuak militia, Kwot Agid and Omot Obang to fly to Addis Ababa to become the needed witnesses on behalf of the government. After the massacre of 2003, there were Anuak who were resisting in the bush. What the TPLF government did back then was to create their own Anuak militia to fight against the Anuak insurgents. Kwot Agid had become the head of this group; but had carried out his duties in such a way that he earned the respect of the Anuak. However, Governor Omot chose to use them as witnesses, claiming they knew those being charged and believing they would align with the government. When Kwot Agid and Omot Obang appeared in court in Addis Ababa, they refused to lie. They said that the accused had never been involved in the December 2003 killing of the Anuak. Furthermore, they went on to say that they knew for a fact that the Anuak did not kill the Anuak victims of the massacre. The government prosecutors then asked Governor Omot what to do because they had no evidence now to convict those charged. Insider reports indicate that Governor Omot gave directions to put the two in Kaliti prison. That is where they remain. Word has been received that they have been tortured. Now the regional government is planning to disarm the Anuak militia, previously under Kwot’s control; believing they no longer hold any allegiance to the TPLF government. They are among the few remaining Anuak who still have guns. With the new influx of troops, the increasing land-grabs, the dislocations of the people, the repression of all political rights, the rumored arrests, the disarmament, the shootings and the increased human rights abuses; all accompanied by intense pressure on the people to cover up for the perpetrators of the genocide, no one knows what will happen next. The last disarmament preceded the genocide. What are they planning now as signs of their desperation are everywhere? Problems in Gambella happening all over Ethiopia demanding shared response! The increasing oppression being faced by the people of Gambella are also being faced by people all over the country; from the regions of Afar, Oromia, Beninshangul-Gumuz, Amhara, Ogaden, Harare, Southern Nations and in Tigray. Most Ethiopians have now become either the enemy of this government and a target of their control or they are considered ‘discardable’ people to be forgotten and neglected; that is, until they “get in their way”—like the many voiceless indigenous people whose total way of life will be affected by the opening of the Gibe III Dam. In Gambella, as the TPLF try to force the Anuak to condemn the VOA and the Genocide Watch report, the Meles regime is also attempting to force students at Jimma University and Haraghe University, as well as in other places, to sign a petition in protest of the U.S. State Department’s Human Rights Report. They are probably intimidating the students in these locations like they are doing in Gambella. In the same way, the threats to those who speak out in Gambella are no different from what is happening in other regions. For instance, on March 31, 2010, in Oromia, the regime gave a death sentence to an Oromo nationalist and political prisoner, Mesfin Abebe Abdisa, and a life prison sentence to another Oromo nationalist and political prisoner, Tasfahun Camadaa Gurmessaa. Thirteen other Oromo nationalists were sentenced to ten to twelve year terms. In another incident, an Oromo opposition candidate from MEDREK, under the sub-party of the coalition, Unity for Democracy and Justice (UDJ), was recently stabbed, but is recovering. The Meles regime is also preventing UDJ imprisoned political leader Birtukan Mideksa from being treated like all other prisoners, preventing visits from party leaders, friends and most family members. They are also opposing efforts to obtain necessary medical care for her deteriorating physical and mental health. These strongman tactics are the frantic last ditch efforts of a tottering regime, who have few options right now. If they admit the truth and give the opposition an even playing field, they will lose; yet, deepening the repression will create more solidarity among the opposition. They used to be able to count on Tigrayans to hold them up, but that support appears to be disintegrating. As they make futile attempts to cover up an incriminating history witnessed by countless Ethiopians, their expectations are out of touch with reality; reaching the point of the ridiculous. Instead, with each defensive overreaction to the truth, they are simply making more public their repressive nature and further exposing their crimes to the world. The suffering, hardship and misery of the Ethiopian people from every region, ethnicity, religious group, political group, viewpoint and background has begun to unity us like the land that has held us together as a people and a country. We must be careful to not be manipulated by some groups with their own hidden self-interests, from both inside and outside of Ethiopia, who can profit by a weak and divided Ethiopia. They fear unity will result in a strong Ethiopia (and Horn of Africa), which stands together not only for one’s own rights, but for the rights of our fellow-Ethiopians both inside and outside of our own groups. Those who stir up our emotions about our grievances towards each other, pretending he or she cares about us while encouraging never-ending anger, hate and alienation, are NOT working in our best interests. As they attempt to create irreconcilable divisions, calling our country a “fake Ethiopia” or “fake Abyssinia,” they pretend to align with the oppressed and downtrodden, but what is their real goal? Is it to bring about an atmosphere where legitimate grievances—and there are many—are openly confronted and dealt with or is it to keep us divided so as to advance their own interests? Have you ever wondered if someone might be paying such people to put so much energy into keeping the rifts going between Ethiopians? Do not be fooled by such people. They have their own agendas that seek to prevent a strong and united Ethiopia from ever emerging. The answer to the suffering is when we all are valued as diverse people and the evidence of that is legally carried out in our laws, policies and daily practices. With God’s help, we can overcome those who want to divide us for their own purposes by putting humanity before anything else. Like most every other people and nation in the world, we (Ethiopian) have committed terrible wrongs towards each other; but perpetual hate, revenge, violence and anger are not the answer that will free us. What will free us is reconciliation where forgiveness, confession and equal justice heals the wounds we have carried with us for years. The wounds are real and hurt, but simply inflicting new wounds on others will do little to heal our own. We need a new paradigm of thinking. It is a conscious decision to discard the destructive thinking of hate for loving our neighbor as we love ourselves. This is the revolution we need in Ethiopia! We, as diverse people from within the boundaries of Ethiopia, must work together for each other because none of us will be free until we all are free! May God give us the strength, wisdom and grace to embrace each other as we seek to create that new Ethiopia where we value the humanity of everybody and where our diversity becomes our beauty in the splendor of the new gardens of Ethiopia!May God bless Ethiopia and the beautiful and precious people of Ethiopia! The fact that these civilian settlers from the highlands were killed in 1991 by a man who was of Anuak ethnicity, is not in question among most. However, these victims were not killed by “the Anuak ethnicity,” but by one man and possibly some accomplices. The man was later killed. If we are to have a just society in Ethiopia where the rule of law is held up, holding an entire ethnicity responsible for crimes—or cover-up—committed by one or more perpetrators from that same ethnicity, must end. Revenge tribal killings have promoted a culture of never-ending violence. Additionally, the current regime has repeatedly used random killings of innocent civilians in response to crimes by others of their ethnicity. They have also used “collective punishments,” like withholding food and medical aid in the Ogaden, for actions they attribute to the ONLF. Evidence also exists that the Meles regime has sometimes staged the commission of violent acts towards one group—even their own—in order to justify indiscriminate retaliatory vengeance (counter-insurgency) against total ethnicities.